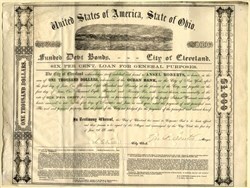 Beautiful rare $1000 Bond Certificate from the City of Cleveland, Ohio issued in 1864. This historic document has an ornate border around it with a vignette of a scenic waterfront. This item has the signatures of the Mayor, George B. Senter and City Clerk, and is over 149 years old. The bond is indebted to Ansel Roberts or bearer in the sum of $1000. Punched cancelled. This is the first time we have had this for sale. George B. Senter (1827 to 1870) was the mayor of Cleveland from 1859 to 1860. Senter was born in Potsdam, New York to David K. and Susan Senter. Senter was elected to city council from the 1st ward in 1858 and was then elected to mayor in 1859 serving until 1860. It is assumed, since there is no military record for Senter, that he served in the Civil War as assistant commissary-subsistence officer at Camp Taylor in Cleveland in April and May 1861. He was promoted to commandant of the camp in 1862 serving until 1864. When Irvine Masters, mayor of Cleveland, resigned his office in 1864, Senter was elected by city council once again to serve as mayor and finish Masters's term. Senter retired from the political life to practice law and pursue the wine and liquor business. Senter died at his home on Euclid Avenue in Cleveland in 1870. He is buried in Woodland Cemetery. Senter married Delia Wheaton in 1851 and they had 3 children: George B. Senter Jr., Cornelia E., and J. Augusta. As one of thirty-six founders of the Connecticut Land Company, General Moses Cleaveland was selected as one of its seven directors and was subsequently sent out as the company's agent to map and survey the company's holdings. On July 22, 1796, Cleaveland and his surveyors arrived at the mouth of the Cuyahoga River. Cleaveland quickly saw the land, which had previously belonged to Native Americans, as an ideal location for the "capital city" of the Connecticut Western Reserve. Cleaveland and his surveyors quickly began making plans for the new city. He paced out a nine-and-a-half-acre Public Square, similar to those in New England. His surveyors decided upon the name, Cleaveland, after their leader. In October, Cleaveland and his staff returned to Connecticut where he pursued his ambition in political, military, and law affairs, never once returning to the settlement he established. The village of Cleaveland was incorporated on December 23, 1814 and its first citizen of European extract was Lorenzo Carter, who made Cleveland a solid source for trade. He also built a large log cabin for newcomers to settle in. The spelling of the city's name was changed in 1831 by The Cleveland Advertiser, an early city newspaper. In order for the name to fit on newspaper's masthead, the first "a" was dropped, reducing the city's name to Cleveland. Another account is that the spelling changes came from an error on a surveyor's map. The new spelling stuck, and long outlasted the Advertiser itself. Though not initially apparent � the city was adjacent to swampy lowlands and the harsh winters did not encourage settlement � the location proved providential. The city began to grow rapidly after the completion of the Ohio and Erie Canal in 1832, turning the city into a key link between the Ohio River and the Great Lakes, particularly once the city railroad links were added. In 1822, a young, charismatic lawyer and politician, John W. Willey came to Cleveland and quickly established himself within the city. He became a popular figure in local politics and wrote the Cleveland Municipal Charter as well as several of the city's original laws and ordinances. Willey was then elected the first mayor of Cleveland for two terms. With James Clark and several others, Willey bought a section of the Flats with plans to transform it into Cleveland Centre, a business and residential district. Willey then bought a piece of land from the southeast section of Ohio City across from Columbus Street in Cleveland. Willey named the new territory Willeyville and subsequently built a bridge connecting the two sections, calling it Columbus Street Bridge. The bridge siphoned off commercial traffic to Cleveland before it could reach Ohio City's mercantile district. This action aggravated citizens of Ohio City, and brought to the surface a fierce rivalry between the small city and Cleveland. Ohio City citizens rallied for "Two Bridges or None!". In October 1836, they violently sought to stop the use of Cleveland's new bridge by bombing the western end of it. However, the explosion caused little damage. A group of 1,000 Ohio City volunteers began digging deep ditches at both ends of the bridge, making it impossible for horses and wagons to reach the structure. Some citizens were still unsatisfied with this and took to using guns, crowbars, axes, and other weapons to finish off the bridge. They were then met by Willey and a group of armed Cleveland militiamen. A battle ensued on the bridge, with two men seriously wounded before the county sheriff arrived to end the violence and arrest many. A court injunction prevented further confrontations which may have led to an all out war between Cleveland and Ohio City. The two cities eventually made amends and Ohio City was annexed by Cleveland in 1854. The Columbus bridge became an important asset for Cleveland, permitting produce to enter the city from the surrounding hinterlands and build the city's mercantile base. This was greatly increased with the coming of the Ohio & Erie Canal, which realized the city's potential as a major Great Lakes port. Later, as a halfway point for iron ore coming from Minnesota across the Great Lakes and for coal and other raw materials coming by rail from the south, the site flourished. Cleveland became one of the major manufacturing and population centers of the United States, and was home to numerous major steel firms. By the end of the American Civil War, Cleveland was one of the five main oil refining centers in the U.S. (besides Pittsburgh, Philadelphia, New York, and the region in northwestern Pennsylvania where most of the oil originated). Standard Oil began as a partnership based in Cleveland, between John D. Rockefeller, William Rockefeller, Henry M. Flagler, and Samuel Andrews. Prior to the American Civil War, Clevelanders viewed the slaveholding South based on political affiliation. While a majority of Clevelanders tended to side with the abolitionist North, not all of them loathed slavery, nor were they all convinced that a civil war would resolve ideological differences between North and South. As election year approached and impending clouds of war loomed, rhetoric of Cleveland's local newspapers became increasingly divided. For example, The Cleveland Herald and Gazette and The Cleveland Leader, both largely Republican papers argued that southern actions had driven John Brown to raid Harpers Ferry on October 1859. The Plain Dealer, a largely Democratic publication blamed Brown and abolitionist Republicans for the raid. When Abraham Lincoln won 58% of the vote in 9 of 11 wards for the presidency and as the secession crisis loomed closer, the partisan rhetoric of Cleveland newspapers became more and more aggressive. The Herald celebrated Lincoln's victory as one of right over wrong, of Unionists over secession-minded southern Democrats, while the Leader dismissed threats of the South's secession. The Plain Dealer, meanwhile argued that secession was imminent. When war finally did break out on April 1861, Cleveland Democrats and Republicans decided to end their dispute and united to form the Union party to support Lincoln's war effort. However, this coalition did not go untested. The Civil War years brought an economic boom to Cleveland. The city was making the transition from a small town to an industrial giant. Railroad iron and gun-carriage axles were manufactured for military use. Due to the cutoff of Southern trade, Cleveland opened its first tobacco factory, T. Maxfield & Co., in 1862. The city's garment industry also began to prosper. The German Woolen Factory (also in 1862) became the first company to manufacture wool cloth in Cleveland. By 1865, its banks held $2.25 million in capital and $3.7 million in deposits. In 1863, 22% of all U.S. Naval crafts built for use on the Great Lakes were built in Cleveland. That figure increased by 1865 to 44%. Civilian aid to the military centered around establishment and maintenance of the Soldiers' Aid Society of Northern Ohio (1861), the U.S. General Hospital (1862), Camp Taylor (1861), and Camp Cleveland (1862). Food, blankets, and reading material were provided by citizens to recruits at both military camps until government stores and equipment could be distributed. When the war ended, Cleveland welcomed home troops after service in the field, treating them to a meal and a short welcoming ceremony on Public Square before they marched to Camp Cleveland for payment and discharge from the army. Those Clevelanders who died in the war were honored at Woodland Cemetery with the memorials commemorating the 7th Ohio Volunteer Infantry Regiment and the 23rd Ohio Volunteer Infantry Regiment. The issue of full emancipation still lingered about. The Herald and the Leader supported the proposed Emancipation Proclamation of January 1, 1863, commending Lincoln for the "for the stalwart blow he struck for freedom and for the peace and future tranquility of the Union." The Plain Dealer, on the other hand, argued that the only purpose of the war was to preserve the union and that making "citizens of the entire black population" would ultimately tarnished the white race. The Civil War vaulted Cleveland into the first rank of American manufacturing cities and fueled unprecedented growth. By 1870, the city's population had shot up to 92,829, more than doubling its 1860 population of 43,417. Many mansions were built along the city's more prominent streets, such as the Southworth House along Prospect Avenue, and those on Millionaire's Row, on Euclid Avenue. Yet the population growth also fostered the need for efficient police and fire protection, decent housing, public education, health services, transportation, and better roads and streets. After the Civil War, political power shifted from Democrats to Republicans. The main architect of this conversion was industrialist Mark Hanna, who entered politics when he was elected to the Cleveland Board of Education aronud 1869 and became a political kingmaker.